Frankly, the only reason why Hellboy gets a half-star is because POPAXIOM's CMS doesn't allow a score any lower than that. 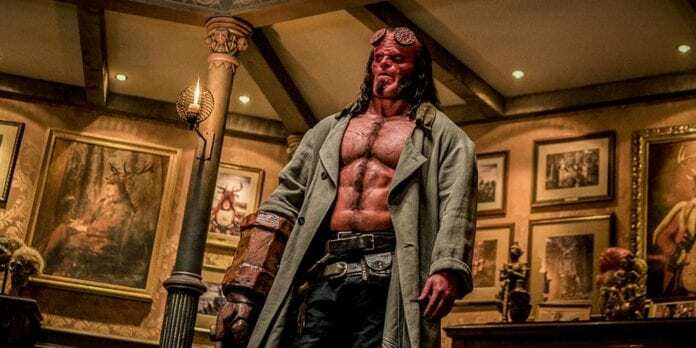 Hellboy is a reboot of the franchise based on Mike Mignola’s fan-favorite graphic novels after plans for another sequel to Guillermo del Toro’s two adaptations fell through. The film stars David Harbour (Stranger Things) as the eponymous demonic hero in a battle against an evil sorceress (Milla Jovovich, the Resident Evil franchise) who is hell-bent on bringing an end to humanity. To put it nicely, this movie is a mess. In more direct and honest terms, this movie is so bad that one may wonder why the servers containing the footage weren’t all wiped clean in an “unfortunate accident”. This is an assault on your senses in pretty much every way. Perhaps the filmmakers thought that if they threw enough stuff at the audience, people would get caught up in the energy of the film. Instead, the energy is obnoxious and often excruciating. It feels like so much happened in this movie, but the plot is ridiculously simple. Hellboy’s arc is that of an anti-hero who has to learn to accept, but not embrace his dark side to conquer the villain for the greater good. It’s not like that hasn’t been done what seems like a million times before. The story also has a bunch of ridiculous subplots, like one involving a hog-like shapeshifter that wants revenge on the protagonist or one about a group of giants wanting to wreak havoc on England. The story is very incohesive and nearly incoherent. The only merit in the script comes in the form of the mid-credits scene. Yes, they think that this film will make enough money to warrant a sequel. Unless it makes a ton of money overseas, this won’t even make back its relatively modest budget. This mid-credits scene features a cameo from a fan-favorite character in the graphic novels. This scene had the wittiness that one would expect of a movie like this, but the humor in the rest of the movie is downright awful to the point that it is cringe-worthy. Some of the puns and their delivery will make you want to scream at the screen. There is also an action scene at the very end of the film that shows the potential of what this movie could have been. Not the big finale — that was awful — this is a brief stinger after the finale that is a tracking shot of the characters as they fight off a few bad guys. Even though this scene lasts only a couple minutes, it is the most fun part of the entire film. Had the whole movie been like that, it would have been a hell of a lot more fun. As is, you are left wondering what could have been — either in a better version of this entry or a doomed sequel. Milla Jovovich stars as ’Nimue the Blood Queen’ in HELLBOY. Photo Credit: Mark Rogers. The rest of the film’s action is just as terrible as you would expect. The CGI and editing are absolutely horrendous. The editing is worse than that of Bohemian Rhapsody and Suicide Squad combined. Some of the places where there were cuts were inexplicable, and some scenes were cut so rapidly that they were nauseating. You could tell from the trailers that the CGI was going to be rough, but it is even worse than you could have imagined, particularly during the scene with the giants. The only thing in the movie that looks good is Hellboy’s makeup, which is the bare minimum in a movie like this. Most of the actors don’t give particularly good performances. The only two who were even mildly admirable in their roles were Milla Jovovich and Ian McShane. Jovovich is hammy and over-the-top in her role, but she is still at least somewhat enjoyable to watch. Hopefully someone else will pick up on her potential and cast her in a villain role in a much better-written film. McShane is solid as the mentor character because that’s the archetype in which he usually fits best (think John Wick). It’s a shame that he is given little more to do than deliver exposition, as he is a seriously talented actor and one of the best parts of the movie. 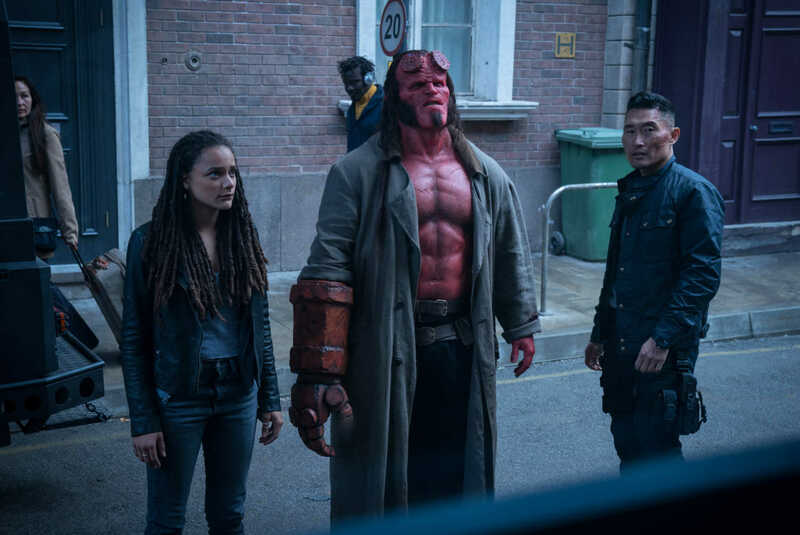 Alice Monaghan (Sasha Lane), Hellboy (David Harbour), and Ben Daimio (Daniel Dae Kim) in HELLBOY. Photo Credit: Mark Rogers. The other cast members… tried… maybe? Harbour seemed like a good fit for the character on paper, but in execution, he does not fit in the role at all. Perhaps it is the script or the direction, but his delivery was horribly wooden. He seems to have no ability to deliver the witty one-liners that are one of the character’s signatures. Even though many of them were poorly-written, there were a few decent ones that he ruined. 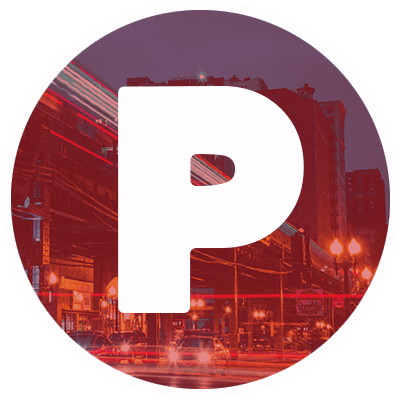 Sasha Lane and Daniel Dae Kim don’t do a much better job than Harbour. Lane is one of the most talented up-and-coming actresses in the indie world, as proven by her turns in American Honey and The Miseducation of Cameron Post. Well, she should stick to those more subdued, emotional roles, as she doesn’t appear to have the skills required to pull off an action heroine. As for Kim, he didn’t really add much to the film. It seemed like he was phoning in his performance. This is disappointing, because that character is actually really interesting. At least they didn’t whitewash the role. 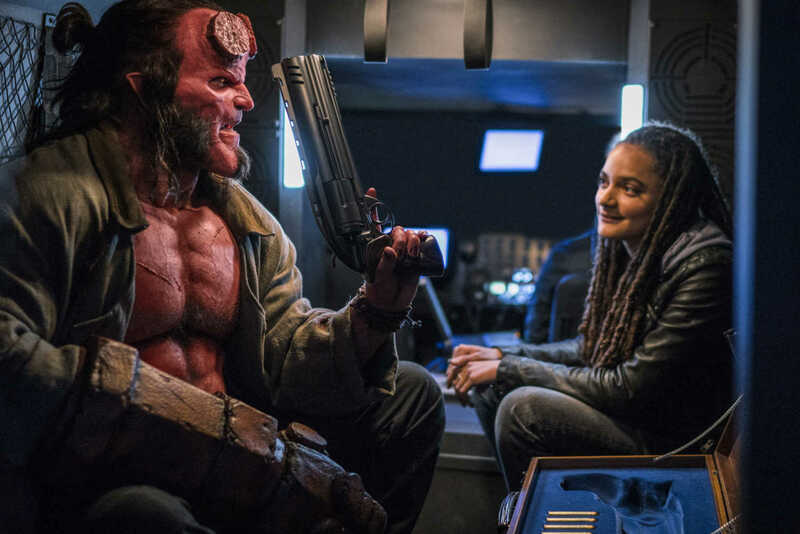 Overall, Hellboy is certainly one of the worst movies of 2019 so far. Although it does have a few (very few) redeeming qualities, it is a painful two hours of your life that you will never get back. There probably won’t be a sequel, but if there is, at least the end of the film teases some potential for growth. There isn’t anywhere to go from here but up. Or is there? Hellboy is now playing in theaters.